But still! This is homemade alphabet soup, the kind Andy Warhol might make a painting of. The kind that you used to spell out your name and the name of your cats with when you were a kid. The kind my mom used to put in an omelet! Although I still haven’t found anyone else who grew up on that particular delicacy. It’s a really really really really really really simple, tomato-based vegetable soup. It’s not especially innovative, but it does exactly what Alphabet Soup is supposed to do — it hits the spot! Everyone needs a basic recipe like this. I love using yukon gold potatoes since they don’t need to be peeled, but if you’re using russets then peel them first — the texture will be better. Also, if you’re like me and don’t have alphabet pasta, you can use tiny shells, wheels, orzo or macaroni. Preheat a 4 quart soup pot over medium heat. Saute onion and celery in the oil with a pinch of salt until soft. Add garlic and cook until fragrant, 30 seconds or so. Add agave, tomato sauce and frozen peas and heat through (5 minutes or so.) Remove from heat. It tastes better the longer you let it sit, but give it at least 10 minutes. Taste for salt and seasoning, and serve. Excellent!! Looking forward to making it. Also: when you say “decent”, do you mean “vegan”? Cuz I can send you some vegan alphabet pasta. No, I just meant something that would hold its own with the chunkly veggies. The only ones at my supermarket were tiny (from Eden foods.) I am gonna order some online, but thanks for the offer! How perfect for the colder weather! This looks like my new favorite go to comfort soup! Oh thank you so much! 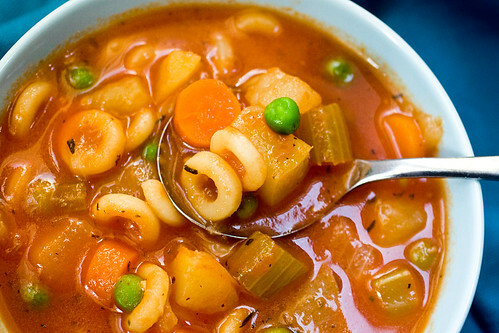 This looks like a real “comfort food” soup – my 3 year old is going to love it. I will definitely be making this for my lady! She loves weird kid foods like this; her favorite dish is that lentil meatball chef boyardee thing. Woah, it’s completely amazing when you can literally taste something in your mouth just by seeing a photo of it. This so obviously captures that childhood lunch staple that I’ll absolutely have to make it next time I’m feeling under the weather or blue — or maybe just after a long Saturday afternoon of making snow angels! This definitely brings me back to my childhood when I would eat the canned kind. I’m sure this is much better! I’m unjustifiably excited about this recipe. Not that it isn’t exciting. Just… I probably shouldn’t be squealing over alphabet soup. That looks so warm and hearty as the cold is justing getting to us here in Chicago this week. My mom found me alphabets the last time I was sick at Whole Foods. They are Eden Organic and made from vegetable!? This looks awesome. Saved and looking forward to making it in the very near future! Thank your for sharing the recipe. This looks so good, and takes me back to my childhood =). Tomato sauce, not tomato paste? Any particular brand you recommend? Where do you find the vegetable broth or do you make your own? I’m having trouble finding on without MSG. Small bags of alphabet noodles are located in the Hispanic section of regular grocery stores in SoCal. Just made this soup and subbed a can of whole tomatoes which i blended. worked fine, super tasty. Made this tonight with orzo, since it’s what I had in the pantry. This is seriously good soup. Thanks for another winner, Isa. Made this for dinner with the orzo instead of alphabet pasta, couldn’t find it at whole foods. Delicious! This is so fantastic. I pretty much followed the recipe exactly, but added mushrooms since they were wasting away in the fridge. I was honestly just banking on this to be an easy nutritious cheap meal, but I enjoyed it so much more than that. Oh, I also added a big drizzle of a nice olive oil on top of each bowl and served with salad and garlic bread. This is going into our monthly rotation! Uber-yum, Isa! This is an awesome recipe. I used the DaVinci brand of alphabet pasta; my local Whole Foods stocks it. Ah! So lucky! My WF has a pretty limited pasta selection. Tried it and loved it. My dad actually asked, “Is this Campbells soup?” It was great on a cold night with some warm, gooey grilled cheese. Thanks for the recipe. I just made this for dinner, and it was fantastic! Super easy to make, and such great flavor. I did add some mushrooms and leeks to the veggie mix. Perfect for a cold, rainy Vancouver night! Thanks so much! I made this four times last week! Once for my fam and gave three pots away to friends. This is a keeper recipe. Basic, inexpensive, quick, and delicious! THANK YOU! This is a great soup to make on a weeknight when you want something homemade, but don’t want to spend a ton of time in the kitchen. Thanks much! We made this last night … whole family LOVED it, including the one kid who usually doesn’t care for soup. Definite keeper. I couldn’t find alphabet noodles, sadly. However, this soup was DELISH (and I don’t like tomato soup!). I left the soup for my boyfriend to feed him for the weekend while I was gone, but by the time he got home from work our meat-loving, non-cooking roommate ate THE WHOLE POT. He suggested I make it again sometime. I added kidney beans for protein and used green beans instead of peas. Just the thing I needed for a lazy, rainy day. Plus now I have lunch for the rest of the week. Very good! I just made it to go with calzones tonight! I used DeBoles Alphabet’s! I’ve made this soup three times now! My family loves it. The first time I used 6 cups of broth as the recipe says but I thought it was too soupy. So the second time I made it, I used 4 cups of broth which made it more like Spaghettios! The third time I used 5 cups of broth, which is perfect for me! I used little alphabet pasta, and am now on the hunt for larger ones. This was so good and froze beautifully! My family loved this! Thanks for another fantastic recipe! Hi, I was looking for a new soup recipe because I had a ton of white beans left from a batch of your sausage recipe. I quadrupled that recipe and still had a ton of beans leftover. I made this soup and threw in the rest of the beans instead of pasta and it is wonderful. Yes, I know I can’t call it alphabet soup now. Pasta is not the best choice for me because I cook a couple of pots of soup on Sunday so I don’t have to cook during the week. Pasta tends to disintegrate before I can eat all the soup. Is there a secret to keeping it from doing that? 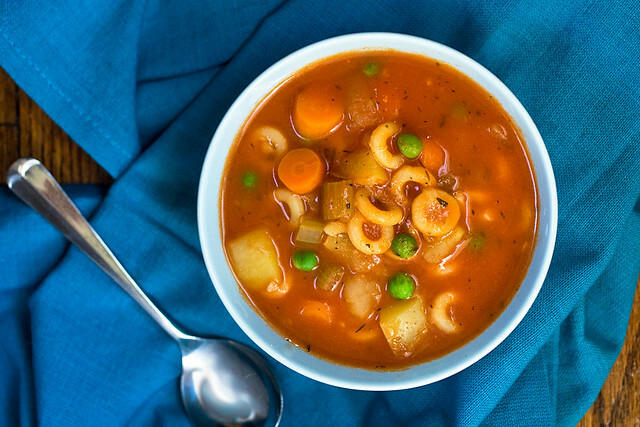 lilyredcloud – Cook all the pasta for the soup when you make it, but don’t actually add it to the soup. Keep it in a separate tupperwear/ziplock in the fridge, and portion it into the soup directly into the bowls when you’re going to eat it, before you heat it up. That way the pasta won’t get soggy. Learned the trick working in restaurants — any kind of pasta, etc., they keep separate as long as possible to make it taste fresh! This soup is AMAZING!! i make it pretty often and even my kids love it (which is pretty rare) Thanks alot for posting this! Fantastic! of course this is just redundant at this point but it’s fantastic. I just made this last night. The only things I changed (initially) were to add an additional celery and to use a different sweetener (as I don’t have agave). It was delicious, but I had major pasta issues! Isa and everyone who has had success, what fraction of a pound was the two cups of pasta you used? With my alphabet pasta, 2 cups = 1 pound! I should have known better, but I added the full amount anyway. That led to adding more water later, but I still ended up with alphabet stew! There is not a drop of broth left to be seen in this massive stew with only a few vegetables smothered by letters. We loved it anyway, but leftovers will be reheated with their volume of water or broth, and next time I will only use half a cup of alphabet pasta. This soup is delicious as well as quick and easy to make! I have made it several times. My husband and I like it with (vegan) cheese and tomato paninis. I just made this and it was fabulous even though I messed up the recipe a little! I thought I had potatoes and did not so I used zucchini that was about to expire. I also accidentally added the tomato sauce when I added the broth instead of waiting. Still amazing and comforting and everything I wanted! Next time I am going to follow the recipe exactly and I bet it will be even better! Fantastic recipe – I have already made this twice. Perfect for this very cold winter we have been having. Freezes well for a tasty, healthy instant meal. Love it! How cute is this!!! Love it! Why do entree recipes call for sugar? I can’t stand the added sugar. This is lunch or dinner, not dessert. Have fruit for dessert. I used to go out to the backyard to get green beans to “snack on.” I could pick black raspberries and red raspberries when they were in the warm, morning sunshine. We weren’t farmers…we had a garden in our backyard. We had the plants I mentioned; and we had lettuce, radish, cucumber, broccoli, peas, cauliflower. We had a strawberry patch and crab apples. It was a good childhood for someone who did not have a lot of animal protein upon which to depend. My parents had 6 children, but we had so much when we had our garden, and my Grandma’s garden (she lived next to us). I realize that Vegan is so much more than just “eating your vegetables.” It’s about morality. I am not sure why the need for agave, I guess the canned stuff was sweet? My kids have knowledge of sweet soups so I just omitted it. I have not eaten canned in so long I cannot remember it at all. Very nice soup I will make often though. I omitted potatoes and carrots and used a bag of frozen mixed vegetables too. Just what I had already. no knowledge of sweetened canned soups, sorry. If in transition off canned soups though for the kids, I would say use the sugar though, or they may not like it. I just did not need too. Sorry I asked even only to answer myself LOL> long tiring day. I will happy to have the leftovers for this for tomorrow’s lunches. OH and I used macaroni, only pasta shape I can find in organic. I’ve been making the soup for a couple of years now… or an idea of it. I don’t like celery or peas so I omit them and add zucchini and mushrooms instead. It is an excellent soup to have on hand for the week. I sometimes add the agave, and sometimes not, depending on the acidity of the canned tomatoes. It doesn’t make the soup sweet to add it, but can round out the flavor if the tomatoes need it. 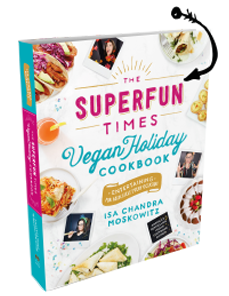 I realize that i am commenting on a recipe from 5 years ago, but i just wanted to say I make this all the time for my little squish and she LOVES it…. and so does the entire family. My 17 year old sister will eat the whole pot if i turn my back for a second. Love love all that you do Isa, and can’t wait for Modern Love Brooklyn!!!! I also realize I’m commenting on an old recipe. BUT I went to 6 different stores looking for alphabet pasta. FINALLY I found some at Whole Foods, it appears that it is new there. I am going to cook this recipe with a group of 4th graders, and they are going to have so much fun!